This is really strange because on GSV, you can see tons of old BUSINESS US 59/SH 43 assemblies still standing, but the route does not appear on old TXDOT General Highway Maps. Right now my best guess is that, starting on the south side of town, BUS US 59 headed W on SH 43 (Pinecrest), then turned N on Washington, where it became BUS US 59/ SH 43. From there, I believe it turned E on Travis, then N on Alamo. 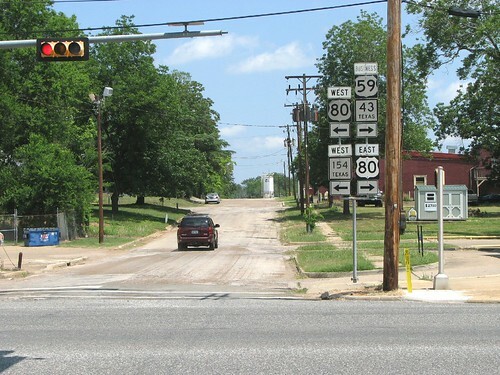 At US 80, the assembly confirms that it turned E on US 80 back to the parent route. The 1936 map shows US 59 still on the route. The 1961 map shows that US 59/ SH 43 had been moved to a new route north of Pinecrest, but US 59 was still on Washington south of Pinecrest. The 1961 map does not show the business route to be on the state highway system, even though the route markers are newer than 1961. The old assemblies are on Washington from SH 43 (Pinecrest) to Travis. There is a full assembly NB Alamo at US 80 that includes the Business Route. Marshall is in Harrison County if you want to look at he old maps. I haven't found anything in the minute orders. I have just found that there was also a BUSINESS US 80 in Marshall. I've seen it on a map or two, but all the signs are gone. I may be that way later this year, so I'll try to remember to look. Just found another clue in this pic: https://texashistory.unt.edu/ark:/67531/metapth18170/m1/1/zoom/?q=marshall&resolution=0.5&lat=1465.266085385536&lon=810.3999938964839, There is an assembly on the right side of westbound Houston St at Franklin St. The bottom plaque is faded and not legible, but due to its shape, and the presence of another assembly at the intersection facing traffic that is southbound on Franklin, Id say the assembly on the right is BUSINESS 80 --->. Interesting that the Alamo/Grand intersection has the West TX 154 assembly but yet there is nothing else around, west on Grand or otherwise. The nearest current TX 154 assembly to that is the one where it intersects/terminates at Loop 390. I checked the Designation Files, and there's nothing listed for history or past instances of Bus US 59 or Bus TX 43 in Marshall. I wonder when or if the route was ever 'official'. I guess there could be paperwork for it that didn't get posted online. 154 has its own history. NW of Marshall, it was part of the Jefferson Highway. Or they were locally maintained routes. I've never heard of a "locally maintained route" that is signed by TxDOT not being included in the designation files. It is also worth noting that we have not been able to find a designation file for former BUSINESS US 77 in Denton. Then you've never heard of the business routes in Marshall. Even though 59/43 was partially posted as of a few years ago. I did find a good explanation for why SH 154 is on that assembly at Grand & Alamo. A map from 1932 shows that US 80 was still on Houston St, but SH 154 was on Grand from where W Loop 390 is today east to Downtown. Here's a link that I posted previously that shows Us 80 and SH 154 co-signed on W Grand. Interestingly, the designation file says that SH 154 was to be extended south on what is now Loop 390 from US 80 to SH 43. 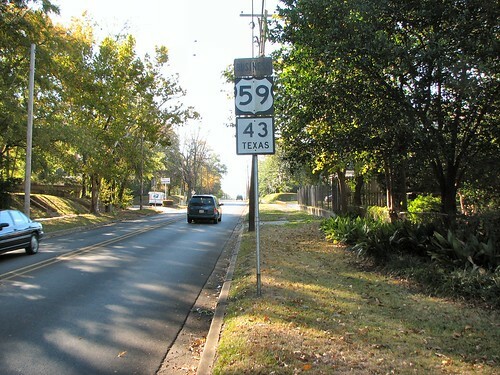 It would then be co-signed with SH 43 east to US 59. It would then continue east on a new road to FM 31, and combine with FM 31 SE to I-20.